We make a range of traditional items in horn, leather and metal. You can either buy from us in person at events or you can order one from us and have it made just the way you want it! Please be aware as items are made to order dispatch can take up to 4 weeks from date order is confirmed via payment of invoice. To place an order please get in touch with us directly, we will send you a confirmation that we have received you message along with PayPal invoice. When ordering please state the item you would like along with the size and finish required. Once you place an order we will be in contact with you to discuss any specifics of your item. If you wish to collect your item from us at an event we are attending, let us know at any point between placing your order and it being dispatched and we will refund any postage you have paid. If you live outside of the UK, please contact us before ordering to confirm postage costs. Check out our in-stock items over at our Etsy Store! Small: up to 1 pint. Medium: between 1 pint and 1 1/2 pints. Large: between 2 and 2 1/2 pints. Please note: All measures are approximations and may be slightly over or under due to the nature of the materials used! 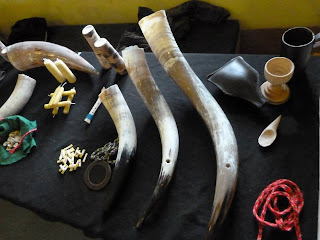 Horns can be either knife finished, bees-wax polished, or clay based polish polished - (the very shiny ones). They come in black/grey/white tones or brown/cream/white tones. 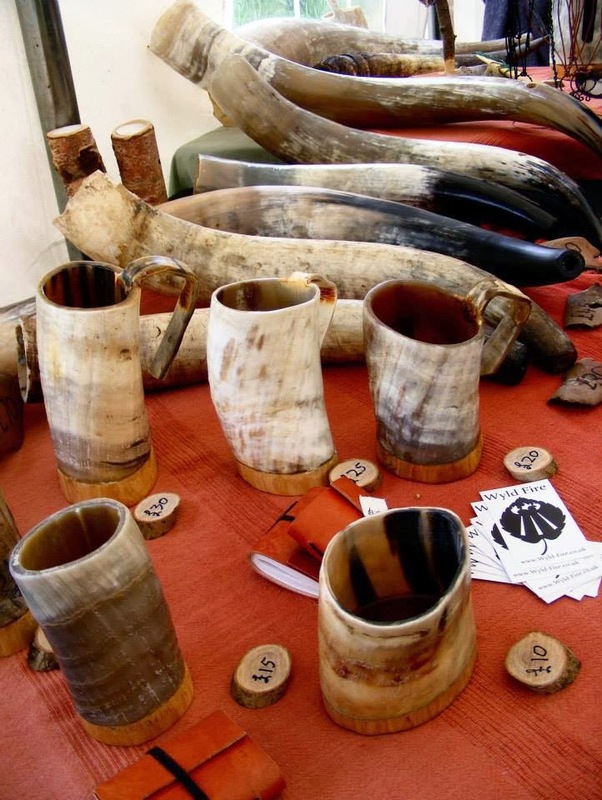 All drinking horns come with a plain leather belt holder but you can select to have a hand carved, custom designed and made leather holder as an upgrade option if you would like. Small: up to 1/2 pint. Medium: between 1/2 pint and 1 pint. Tankards come in either black/grey/white tones or brown/cream/white tones, and can be left rough, lightly polished or polished. They are based with hardwood rounds (not planks) and are sealed with bees wax. Then you need to decide if you'd like either black/grey/white tones or brown/cream/white tones, and whether you like the trumpet end trimmed neat, or left natural. Finally you need to look at the finish options and decide if you'd like it raw, knife finished, bees-wax polished or clay base polish polished-(the really shiny ones). 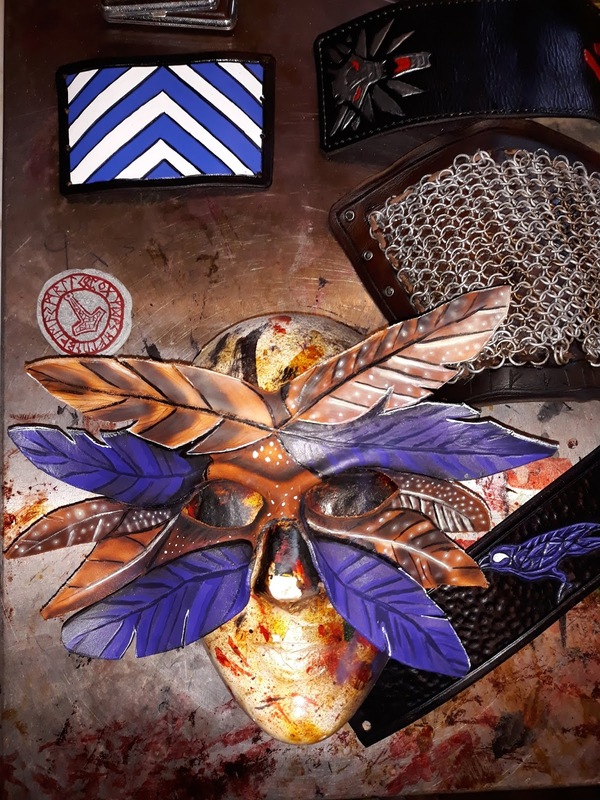 If you're looking for something specific in leather then drop us an email - wyldfire.crafts@gmail.com or message us on our Facebook Page and we can work out exactly what you need.